According to Greek mythology, after the poet and musician Orpheus was brutally killed by Maenads, his severed head, still singing, floated down a river and came to rest on the isle of Lesbos. The subject had been central to French Symbolist painting since the artist Gustave Moreau exhibited his Orphée (Louvre, Paris) at the Paris Salon of 1866. Both Moreau and Redon saw the severed head of Orpheus, singing even after death, as a symbol of the immortality of art. In this pastel Redon created a dreamlike reflection on the mythological theme, rather than focusing on its violent and macabre aspects. 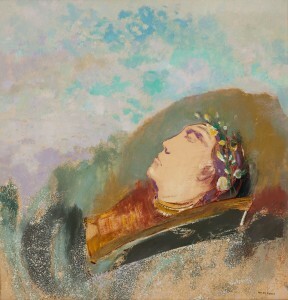 The sleeping head resting on a lyre floats on a background of purple and blue that evokes a magical netherworld. Most of Redon’s paintings and pastels on view at the Armory Show were relatively recent, dating from 1900 to 1912. He was still creating black and white prints during those years, but his paintings and pastels of this period feature rich color and fantastical imagery with an overall lyrical feel. Frank Jewett Mather, Jr., “Art: Old and New Art,” The Nation 96, no. 2488 (March 6, 1913), 241. Thirteen of his paintings and pastels and twenty prints were sold to collectors including Daniel Morgan, John Quinn, and Lillie P. Bliss. The artists and Armory Show exhibitors Katherine Dreier and Robert Chanler purchased Redon lithographs, and the critic Harriet Monroe bought one in Chicago. See Milton Brown, The Story of the Armory Show, 2nd ed. (New York: Abbeville Press, 1988), 120-121, 129, 131, 213.